Surveys show a trend: families have less time than ever to vacation together. Parents expect to get the most not only for their money, but also for their time. When looking at the "value" of a family ski vacation, then, the whole often adds up to more than the sum of the parts, and the bottom line equals more than the absolute price. Sure, we all want to get what we pay for, but it's the quality of the experience, the overall sense of satisfaction and the creation of great-shared memories that are most important. Looking back on our past trips, it's not the cost or even the specific resort that stands out. What remains are the happy memories of skiing together, of sharing the trials (remember that night spent in Steamboat's hospital?) and even the small triumphs (discovering that folks at Hernando's in Winter Park put honey on their pizza crust to create a unique dessert). So, how can we judge a potential vacation for its value? Look at the big picture, imagine yourself in that picture, and try to best evaluate the fit. Do you appreciate first-class service but have somewhat limited funds? Think about a place like Beaver Creek in low season. Are you anxious to get to a distant site, but are wary of rising airfares? Look for packages that include air from a resort's central reservations service or a pro tour operator like Rocky Mountain tours or Colorado Ski Holidays. And, keep in mind the qualities that make a family-friendly resort: ski terrain appropriate for everyone in the family; acceptable lodging (both type and location); half- and full-day ski programs; day care; and après-ski opportunities. The destination should fit your family. 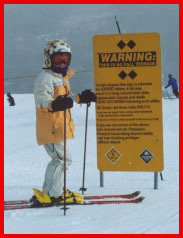 Time of year directly affects cost and can affect snow conditions. Skiing at Thanksgiving will be cheap, but conditions might well be dicey. Skiing during Presidents' Week in February will more likely mean great snow, but at peak cost. The best value of all may be late-March and April: the weather warms, low season prices return and, because March is generally the month that brings the most snow, there's plenty of white stuff. Upside: We rank Smuggs among the best of the best. They've created a family paradise, with a self-contained base village, programming for everyone and all-in-one pricing that's flexible - if you overlap weekends or high-season days, you only get charged high-season rates for those individual days. Their low-season (pre-Christmas, early January, late March) packages offer incomparable value. Downside: It's a fair piece to drive from many northeast population centers, getting from the main base village to Madonna and Sterling Mountains can be cumbersome, and ageing lifts might annoy some. You've gotta like a resort that creates a miniature terrain park for the little ones and beginning tricksters. The village here is nice; the mountain has just one main base; one-price (except holidays) day tickets makes weekend visits easier; vacation packages include lodging, lifts, cross country skiing and snowshoe trail pass, White Mountain Athletic Club access, use of the valley-wide shuttle bus, fireworks every Saturday night (after Dec 31); there's good programming and plenty of off-slope/après-ski activity choices. Downside: The shopping is a bit weak and trail layout is somewhat awkward. If you're traveling with teens. Upside: Huge size; full facilities; excellent packages that can be mixed-and-matched; good lift/lodging package deals even during holidays; full scope of lodging, ranging from slopeside to 20 miles away; very high on the teen/young-adult "coolness" scale. Downside: Killington's so big and spread out that handling little ones here can sometimes be downright scary; if necessary, take the little ones on an adjacent Pico-only visit. Upside: This just might be the friendliest darned place in the east; immaculate grooming and very user-friendly terrain; full pipe and park facilities; a veritable volcano's worth of slopeside lodging with innumerable packaging choices; your three-day or more Okemo lift ticket is good for a day at Mount Sunapee or Stratton. Downside: little truly gnarly terrain for hot shots; a confusing, multi-faceted, multi-base layout. Upside: Our choice for the best of the smaller resorts. Nice slopeside lodging; user-friendly, single base area to which more retail and amenities are being added; excellent intro to ski/ride programs; kids 12 and under stay free; easily accessed from major northeastern metro areas. Downside: being more southerly, rain can be a factor; must travel a bit to shop; might not keep better sliders occupied for more than a day or two. Upside: Steamboat invented the "Kids Ski Free" program, and still do it wonderfully - you buy it (lift tickets, rentals, lodging, etc. ), you're kid does it free; special promotion this autumn with United Airlines offers "Kids Fly Free"; good early-season discount packages; excellent ski school and day care; special kids-only lifts; a real town in which to play, shop and dine - or watch ski jumping competitions; full range of terrain with fantastic tree skiing; full range of lodging, slopeside or otherwise; free bus system goes everywhere. Downside: lift system can be a bit awkward; relatively low elevation can sometimes cause iffy snow; base area and getting to/from outlying condos can be confusing. Pre-Christmas or late season. Upside: they'll spoil you rotten; the expert terrain holds wonderful surprises; superb on-slope programming and day care; its own performing arts center; tons of off-slope/apres-ski offerings; just one main base area; super grooming; fantastic shopping and dining (albeit expensive). Downside: way too expensive for most mere mortals during high season, although money can be saved by lodging in nearby Avon. Upside: Another place that will spoil you rotten; superb grooming; excellent ski school; fantastic (albeit expensive) on-slope food; unmatched grooming; single bottom base area; surprisingly good advanced terrain; easy access to/from Park City; nice packages for low season lodging; reciprocal snowsliding with Park City Resort. Downside: no snowboarding allowed; teens pay adult lift ticket prices; very pricey in high season. Consider staying in the town of Park City and hitting all three Park City area resorts: Deer Valley, Park City Resort, The Canyons. All three resorts have a different personality, dining and shopping in Park City is superb, area transit is excellent, and there are many family activities besides skiing or boarding (tubing, bobsledding, luge, ice-skating, sleigh rides). Upside: great multi-resort packages. Downside: can be crowded during traditional school vacation weeks. Upside: Our favorite "small" Rocky Mountain ski resort; cute-as-a-button, self-contained base village; single bottom base area and overall manageable size; kids 14 and under ski/stay free; incredible amounts of high-quality snow falls here; fine day care and ski school programming; zero crowds, even on weekends; on-site snowcat skiing; ability to ski Jackson Hole for a day or two. Downside: isolated with little shopping; prevalent above-treeline skiing can be impossible in a whiteout; possibility of being stranded by bad road conditions when trying to get to/from Jackson Hole. Upside: Keystone is the "forgotten" member of the Vail Resorts family, but offers fantastic lift/lodging packages that include many other on/off-slope activities; kids ski free with a minimum three-night stay; high standards for day care and ski school; night skiing and pipe/park; interchangeable lift ticket with Breckenridge, Vail, etc. Downside: many base areas; tends to get snow later than its neighbors; limited shopping/dining on-site. Upside: One of the best kids facilities anywhere; great kids' ski school; super disabled program - just seeing all those folks on the slopes will open your child's eyes; excellent self-contained novice area; good terrain for all; spectacular advanced terrain; a low-key town that's not too pricey and very friendly; new slopeside village offers new lodging options; good low season packages; age 5 and under ski free; good free bus system. Downside: can be crowded on weekends; shopping's a bit limited; kids center/programs sell out; parking can be a nightmare. * Sugar Bowl, CA (www.sugarbowl.com). Upside: Great family amenities, spacious lodge and children's ski school. High elevation means great snow. Downside: A bit out of the way if you don't stay right on the mountain. Can be crowded on weekends. Upside: Upside: Families love Northstar. Good terrain and parks, excellent service, quaint village, and good deals on vacation packages during low season. Downside: Can be very crowded on weekends. There are so many resorts in the area it will be tough to get to one every day for two weeks! Count 'em: Sugar Bowl, Donner Ski Ranch, Boreal, Soda Springs, Tahoe Donner, Northstar, on the Truckee Side; and Squaw Valley, Alpine Meadows, Homewood, Diamond Peak - on the North Tahoe side. Add in South Shore resorts, Heavenly, Sierra-at-Tahoe and Kirkwood and there's just too much to cover for any normal family. Upside: tons of world-class terrain. Multi-day interchangeable tickets to northshore resorts. Downside: Tahoe is busy on weekends. Plan on visiting the smaller resorts during peak periods. Upside: Mt. Bachelor has got incredible terrain for kids of any age. Lots or rollers, intermediates, and great parks. The topography in general is very cool - you're skiing on a crater! It's a bit of an adventure. Downside: You have to stay in Bend, and travel up to the mountain every day. Mountain amenities are fairly basic as well. All of Canada is a value bonanza to U.S. visitors thanks to the dollar exchange rate. Here are a few of our family value favorites. Upside: excellent package deals, day care and ski school programs; free skiing for age 6 and under; single main base area; easy access to the wonders of Quebec City; night skiing/riding; interchangeable lift ticket with wonderful Le Massif. Downside: Can be crowded, especially on weekends. Upside: Mont Ste-Anne's little brother makes up for a certain diminutive size with exceptional lift/lodging packages - even during high season; just enough terrain for everyone; friendly day care facility; age 6 and under skis free; night sliding with pipe/park; down home atmosphere. Downside: a bit isolated (a half-hour north of Quebec City); might not be big enough to hold older kids interest for many days; limited shopping/dining. Upside: Ski Silver Star was conceived as a family place, and it's grown into a full-bore resort with terrain for everyone; fun "western" themed base village with family entertainment some evenings; good day care and kids programs; single base; tons of snow; combination packages with Big White; night skiing; world class Nordic skiing; significantly lower pricing than coastal BC resorts. Downside: isolated; limited dining/shopping options. Upside: Another family-style resort that's grown up; nicely laid out base village; good day care/kids facilities; good terrain for all; on-site heli skiing for true adventurers; excellent lift/lodging packages all season. Downside: isolated; limited shopping/dining options. Upside: Lodging is in the village halfway up the mountain, reached by gondola - once you're in there, you're in there; excellent skiing for all, especially above treeline terrain; low-key, friendly atmosphere; more affordable than staying in Banff, but you can steal over to Lake Louise for a day if you want. Downside: once you're in, you're in! Upside: The Killington of the West, or the Vail of the Northwest, size matters and there's plenty of everything here; best for folks with teens and older kids; plenty of après-ski/off-slope options, dining, shopping, whatever; good day care, etc., and excellent low season package values. Downside: too big and too trendy for many folks; huge vertical drop combined with coastal locale can mean odd weather, even rain on the lower half of the hill; can be expensive, even if you're spending Canadian dollars. ...... Mitch Kaplan can be found exploring resorts across the country. He has written numerous books on family travel and winter resorts.